Making up 14.2 percent of the American population, Hispanics are now the largest minority group in the United States. Clearly, securing the Hispanic vote is more important to political parties than ever before. Yet, despite the current size of the Hispanic population, is there a clear Hispanic politics? Who are Hispanic voters? What are their political preferences and attitudes, and why? The first comprehensive study of Hispanic voters in the United States, "New Faces, New Voices" paints a complex portrait of this diverse and growing population. Examining race, politics, and comparative political behavior, Marisa Abrajano and R. Michael Alvarez counter the preconceived notion of Hispanic voters as one homogenous group. The authors discuss the concept of Hispanic political identity, taking into account the ethnic, generational, and linguistic distinctions within the Hispanic population. They compare Hispanic registration, turnout, and participation to those of non-Hispanics, consider the socioeconomic factors contributing to Hispanics' levels of political knowledge, determine what segment of the Hispanic population votes in federal elections, and explore the prospects for political relationships among Hispanics and non-Hispanics. Finally, the authors look at Hispanic opinions on social and economic issues, factoring in whether these attitudes are affected by generational status and ethnicity. 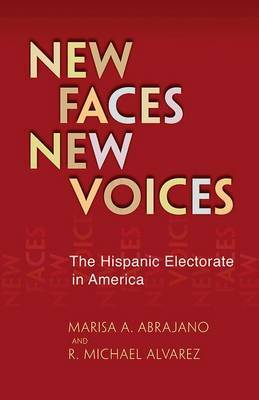 A unique and nuanced perspective on the Hispanic electoral population, "New Faces, New Voices" is essential for understanding the political characteristics of the largest and fastest growing group of minority voters in the United States.